Learn powerful techniques to analyze processes and facilitate process improvement. Be able to practice techniques on your own real-world processes, and leave with multiple improvement ideas. Process mapping can be an extremely powerful diagnostic tool for your organization. By analyzing processes you will not only find process issues, but also uncover structural problems, poor controls, and people issues. You will learn to tap into employee frustration to fix processes and get to the root cause of quality and timeliness issues. Moving to a process focused organization requires both a skill set and mind set. Process mapping will give you the skills you need to enact real process improvement within your organization. In addition to learning specific skills, you will be coached in leading and facilitating the mindset that will launch your organization to the next level of performance. Part of the mindset is the new role of process managers or consultants. Also you will learn to select, organize and facilitate process improvement efforts in your own organization. Finally, you will learn the eight major barriers to process improvement and effective strategies for overcoming these barriers. 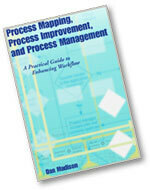 Receive a complimentary copy of the book Process Mapping, Process Improvement, and Process Management by Dan Madison.